Hands down, MuscleTech®/MD AnarchyTM/MC is the most explosive pre-workout concentrate you’ve ever tried – period! Featuring stronger doses of key ingredients than the competition, plus unique compounds used in never-before-seen combinations, AnarchyTM/MC delivers an extreme boost of energy, intensity and mental focus. AnarchyTM/MC delivers more explosive energy & extreme focus per serving than the next leading brand. Plus, it’s the first pre-workout to combine such a potent dose of choline bitartrate, Scutellaria and Rhodiola for an unparalleled sensory experience. Beta-alanine has been extensively studied for powerful athletic support which is why AnarchyTM/MC delivers 3,000mg in 2 scoops. AnarchyTM/MC is also formatted with scientifically studied key ingredients, such as L-citrulline, Withania, and so much more, to take your performance to superior levels, enhance endurance and improve fatigue resistance. 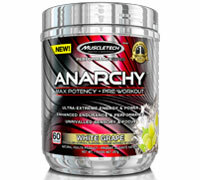 AnarchyTM/MC is crammed with powerful doses of today’s most cutting-edge pre-workout ingredients. It’s more of what you want – and nothing you don’t! AnarchyTM/MC has everything you need to enjoy better workouts that build more lean muscle, enhance strength and amplify power. Try it today! Processed in a facility with products containing milk, eggs, soybeans, wheat, shellfish, fish oil, tree nuts, and peanut flavor. Recommended Use: Helps to promote alertness and wakefulness and to enhance cognitive performance. Helps to relieve fatigue, to promote endurance and to enhance motor performance. Workout Supplement. Athletic Support. Helps the body to metabolize carbohydrates, proteins, and fats. Helps normal growth and development.